When was the last time you got to the end of a day and added up your merits on one side of the page and your demerits on the other side, believing that God was obliged to respond to you based on your score? If you had more merits, you were confident God would bless you in some way; if you had more demerits, you were afraid to go outside during a thunder storm! Every one of us struggles with these legalistic tendencies, even those who have a clear understanding of the Gospel. We understand that we are saved by grace and know that we are designed to live by that same grace, but too often we end up consumed by a merit mentality and live a performance-based life. Even Jesus’ disciples fell into this thinking! Immediately after hearing Jesus’ exchange with the Rich Young Ruler, we see that Peter didn’t quite understand what Jesus intended to teach. 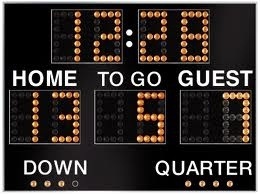 Peter was thinking like a “Scoreboard Saint,” adding up all the good stuff he had done for Jesus and believing he had done more good than bad. He wanted to know what all those hits and runs would earn for him! What Peter forgot was the truth that the grace of God is never earned . . . or it would not be grace. As Paul stated so clearly, “At the present time there is a remnant, chosen by grace. But if it is by grace, it is no longer on the basis of works; otherwise grace would no longer be grace” (Romans 11:5-6). Now, I know most of us will never come right out and admit that we think like Peter, but we all do at times, and only the Gospel can pull up this kind of stinking thinking from the garden of our minds by its root! When God blesses one of His children, He does it only on the basis of His grace and never on the basis of good works. Answered prayer is never a result of our being “good,” it is always a result of God being gracious. To know this truth and to live by it is to truly live a life of freedom and faithfulness to the One who, by His grace, both freed us and is making us faithful. If God is not keeping score, then neither should we! When we are keeping score we fix our eyes on the scoreboard. But when we take our eyes off of the scoreboard and fix them on our Savior, we begin to live in the true power of our salvation—God’s unmerited, unearned, and unconditional favor. Oh, by the way, there was a day in the life of Peter when he stopped looking at the scoreboard and began looking only at His Savior. It was the day Jesus restored him in spite of his three cowardly denials. What a Great God we serve . . . He who is no longer keeping score!